and then developed the final piece. while the body of the Dragon is of Sterling Silver. with garnets and amethysts set into the Mandala of knot work and spirals. 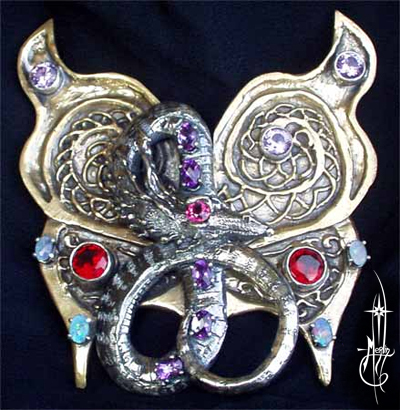 Amethyst and garnets are set into the body of the dragon. The stones were set with sterling tube and prong settings. Three button loops were placed on each side of the wings. displays her creature on her cloak at DragonCon every year! See the website for the close ups of the mechanism!